A hole in one, perhaps? 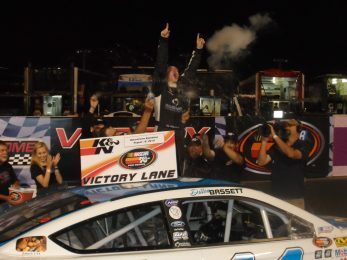 Dillon Bassett sunk the competition in Saturday night’s inaugural K&N East race at Motordrome Speedway, despite having the asphalt come up at the half-mile facility. Two red flags during the 150-lap race wasn’t enough to slow the 18-year-old driver to get around Austin Hill with 25 laps to go to score his first-career series win. Hill and Bassett ran side-by-side for three laps after the race’s final restart on lap 121 before the No. 44 car was out front for good. Pole-sitter William Byron led 92 of the first 93 laps when the tires on the No. 9 Liberty University Chevrolet began to fade and fell into the clutches of Bassett. His 3.357 second victory over second-place Rico Abreu seemed more than exciting to watch. Abreu hung around the back of the pack to conserve his tires for most of the night before making a bull-rush to the front and settling in the second spot. He entered the top-five with 15 laps to go and seven laps later, Abreu made it to second until the checkered flag flew. With the good result, Abreu moves into fifth in points, unofficially to put four of the five HScott Motorsports with Justin Marks cars inside the top-five in the championship standings. The driver putting an end to the HScott points party is New Smyrna winner Austin Hill. The Georgia driver scored his first top-five finish since Loudon with a third-place run. Hill led three laps on the night after engaging in a great battle with race winner Dillon Bassett until losing time to the 44 and being passed by the No. 98 of Abreu within the final 10 laps to score a podium finish. Hill now sits 28 markers behind points leader William Byron, who finished eighth on the night. Second-place points man Scott Heckert grows ever closer to the points lead with a fourth-place result and chopped Byron’s lead down to 12. Byron got the two bonus points for leading the most laps at 92. HScott Motorsports had an up-and-down night, with Byron and Dalton Sargeant combining to lead the race’s first 93 laps before falling back to finish eighth and 11th, respectively. Sargeant ran a late model race in May at Motordrome Speedway to gain more track time for the UPMC Health Plan 150 and won the 30-lap feature. After post-race tech, the No. 5 Wauters Motorsports car had illegal engine parts and the victory was taken away from the 17-year-old driver. Nevertheless, Sargeant ran behind Byron for a number of laps early on before falling through the pack to finish right outside the top-10 in 11th. The action on Saturday night was also in the track, literally, when the asphalt came up on the front stretch to force NASCAR officials to red-flag the race to fix up the patch. After work was done, the race went back under a yellow condition until more problems occurred with the patch to bring back out the red flag for nearly an hour, while NASCAR and track officials tried everything they could to get the track in a race-able condition. Chatter over the radio said that the race could end after the second red-flag, but the Western Pennsylvania fans got to see all 150 laps of K&N East action at Motordrome Speedway. It was the second hole of the weekend, as the aging track saw another hole in Turn 4 Friday evening after the K&N East test concluded. On Saturday, Many drivers gave the thumbs up after the second red flag in the UPMC Health Plan 150 and the final 30 laps were run. TV coverage from Saturday’s night UPMC Health Plan 150 at Motordome Speedway can be seen on Thursday, August 20 at 2:30 p.m. ET on NBC Sports Network. The NASCAR K&N East Series heads next to Virginia International Raceway for the second and final road-course race of the season. Scott Heckert is the defending winner of the race.